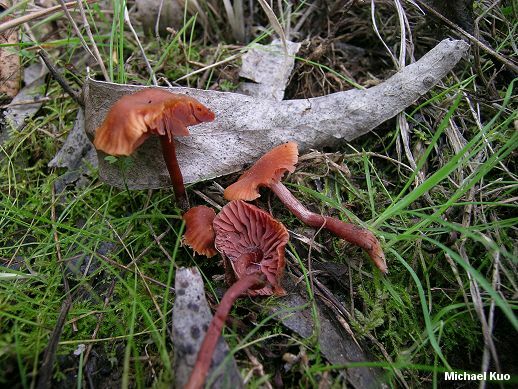 Laccaria fraterna is associated with eucalyptus, and appears to have been introduced to North America along with its mycorrhizal partner. 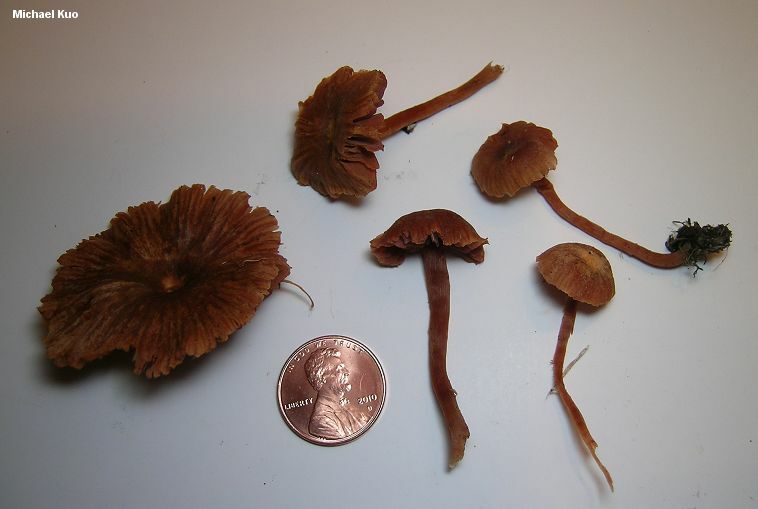 It is a fairly small, reddish brown species with a moderately lined cap and, under the microscope, 2-spored basidia. It appears in coastal California's eucalyptus groves during the winter mushroom season. Ecology: Mycorrhizal with eucalyptus and other exotic ornamental trees (including acacia); growing scattered or gregariously; fall and winter; coastal California and other North American locations where eucalyptus has been introduced. Cap: 1-4 cm; convex, becoming flat and sometimes depressed; faintly to moderately lined; bald or very finely hairy; red-brown, fading to orangish buff. Gills: Attached to the stem; distant or nearly so; pinkish flesh color. 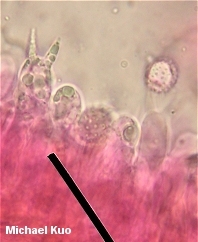 Stem: 2-7 cm long; 3-5 mm thick; more or less equal; finely hairy and often longitudinally lined; colored like the cap, or a little darker; with white basal mycelium. Odor and Taste: Not distinctive. Microscopic Features: Spores 8.5-11 µ; subglobose to globose; ornamented with spines 1-2 µ long, with bases about 1 µ wide; inamyloid. Basidia 2-spored. Cheilocystidia absent. 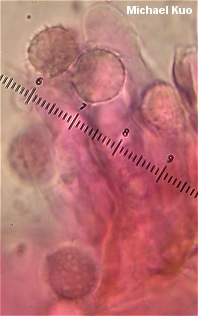 Pileipellis a cutis of elements 5-15 µ wide, with frequent bundles of upright elements; terminal cells clavate or merely cylindric. REFERENCES: (Saccardo, 1891) Pegler, 1965. (Vellinga, 1995; Mueller, 1997.) Herb. Kuo 01131102. This site contains no information about the edibility or toxicity of mushrooms.